We made our annual Valentine’s for you to print and share! Save the photos to make cards or signs or to decorate a Valentine mailbox! Let your imagination go wild! Edmond’s Valentine Video and share the link with all your pals! 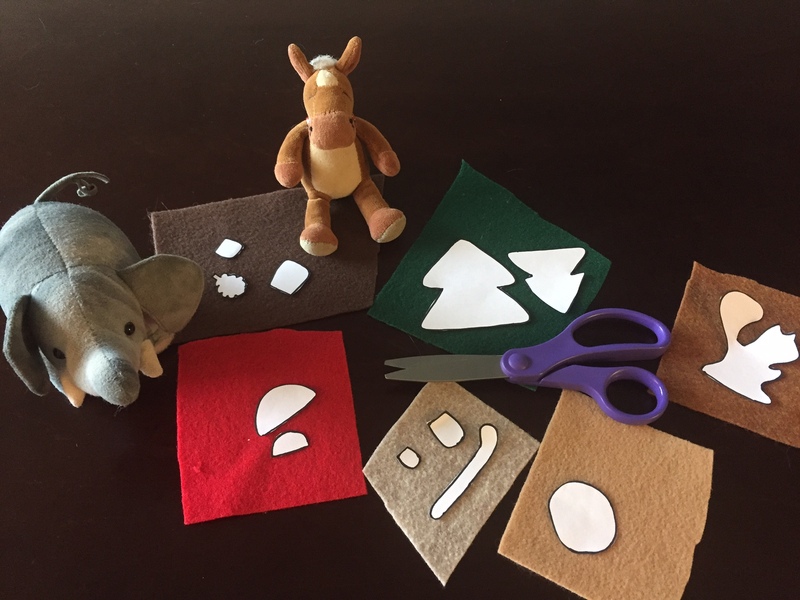 We’re heading over to the craft cabin today to make some felt woodland scenes! 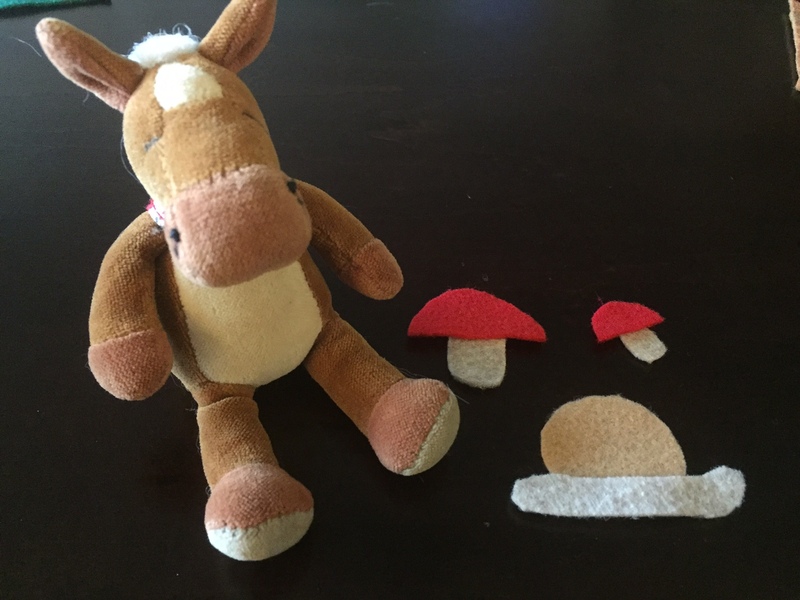 Cut out patterns and then trace on felt. Or you can cut around the patterns on the felt. 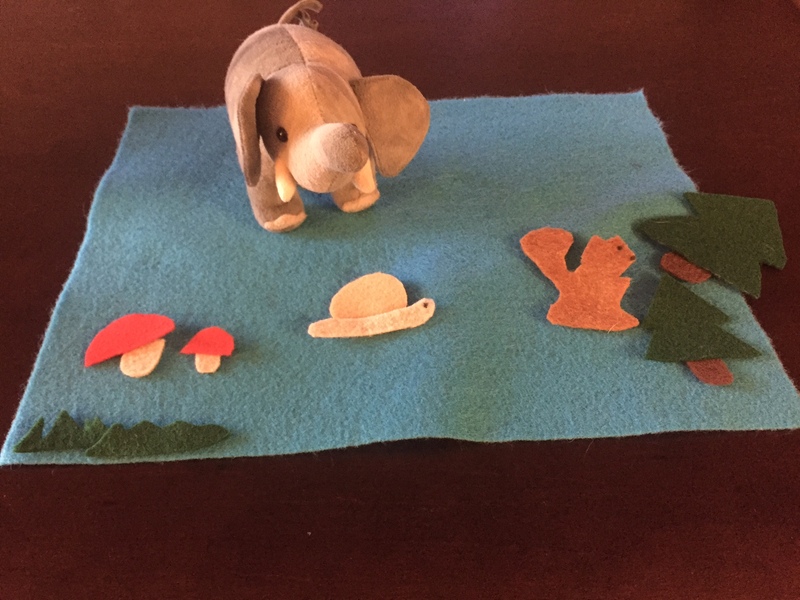 Arrange your felt pieces on a background piece. We used blue. We also added grass. Glue all your pieces on your background. You can use this as the background of a puppet show or hang a picture on it! Remember to show us your finished product! We’re super excited for today’s craft, as it is the start of another fun activity! Today we’re making nature journals! We have some prompts for you to follow on some of the pages and then free pages to do whatever you like on! Just go to the PDF link at the bottom of the post (Nature Journal 2) and print the pages out! Once you’ve done that- we’ll be ready for you in the craft cabin! Take your string and put through both holes. Tie it on the outside- watch to not get your trunk tangled in the string! Use your markers to write your name on the front! Add drawings, stickers and stamps to the front to decorate! You can decorate the back too! WHOOOO’S MADE OUT OF CLAY! YAY!!! It’s craft day at camp! It’s our favorite day of the week! 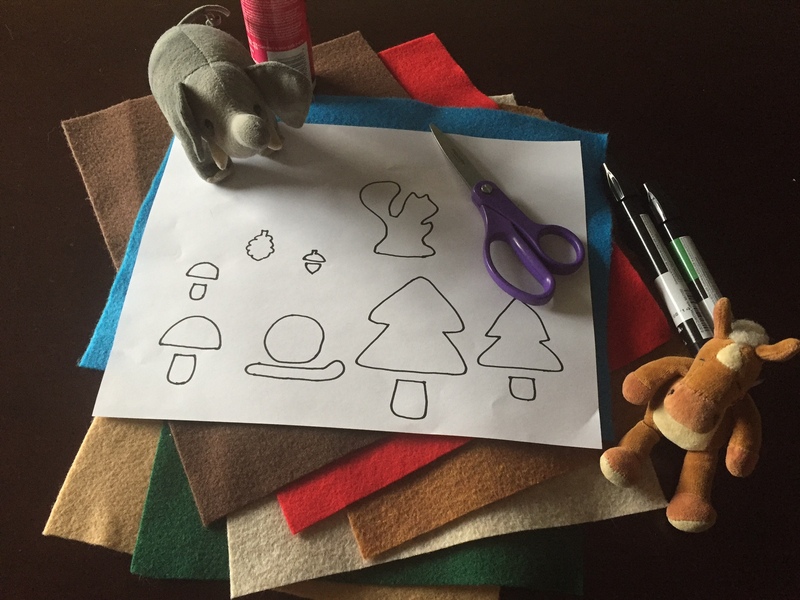 Let’s get started with some great crafty fun! Flatten your ball and indent the top. Then sculpt into points! Take your toothpick and add feathering. Roll two smaller balls of the brown clay. Press the balls flat and make into a tear drop shape. Add the teardrops to your bird for wings. Add feathering to the wings with your toothpick. Make two small balls out of the grey and white. Make the grey ones slightly bigger than the white. Flatten the balls into dots and place on your owl. Add two black balls of clay on the white. Roll three log shapes of the black clay and attach them together. Make two of these for beaks. Add the beak and your owl is done! Make sure to share your pics of your owl when you finish! It’s craft day once again at Camp E&E! Let’s get right to it and make a shark stick puppet! Print and cut out pattern. Then cut out one shark from the blue or grey felt and one from the stiff white felt. Glue the two sharks together. Cut out teeth from soft white felt and draw a black spot on the pom pom (skip if using a googly eye). Then glue the teeth and eye on your shark. Then take your sticks and glue them on the back of your shark. Make sure they are fully dry before you pick up your shark! Once the sticks are dry! You can have a puppet show with your shark! Make sure you give him a nice clean ocean habitat! There you have it! Our shark stick puppet craft! Enjoy making yours and share it with us! Happy craft day campers! We’re going to make shell animals today! Let’s get started! Glue your shells on the paper. You can arrange them in a pattern or put them all around. Draw your animal using the shells as bodies, head or feet- hehe! You can make a whole scene or a bunch of random animals! Use your imagination! Share your crafts with us on Facebook and Twitter! It’s craft time at Camp E&E and we’re excited for today’s craft! Color your wood cutout with marker! Use whatever colors you like! Next glue on the googly eyes and draw any other facial features- we have a happy crab! Glue a magnet to the back of your animal! Make sure to let it dry! Hang your magnets on the fridge, on your bike or your recycling bin :)! When you make this craft- make sure to send us a picture and you’ll earn the Crafty Crabby camp badge! Thanks for being such crafty campers :)! We just couldn’t get enough of hippos this week! So we made a hippo sock puppet and we’re giving you instructions on how to make one for yourself! Cut two pair of teeth and eyes from the white felt. We just freehand cut! Cut two nostrils from the dark grey felt. You could use black here too. Cut two ears from the light grey felt. Glue the ears to the top of the sock! Glue the eyes on top near the ears. Take your black marker and draw a dot on each one. Glue on the four teeth. Two on top and two on bottom! Let your sock puppet dry and then have a blast with your new hippo friend! We’re bringing back crafting 101 here at the University of E & E! Today we have and easy one for you and the kiddos! Press thumb on the ink pad. Place several fingerprints on the paper for monkey bodies. Use your pinky finger to make the ears! Use your black pen (or whatever color you like) to draw the face, arms and legs. Draw and color and habitat for your monkeys! 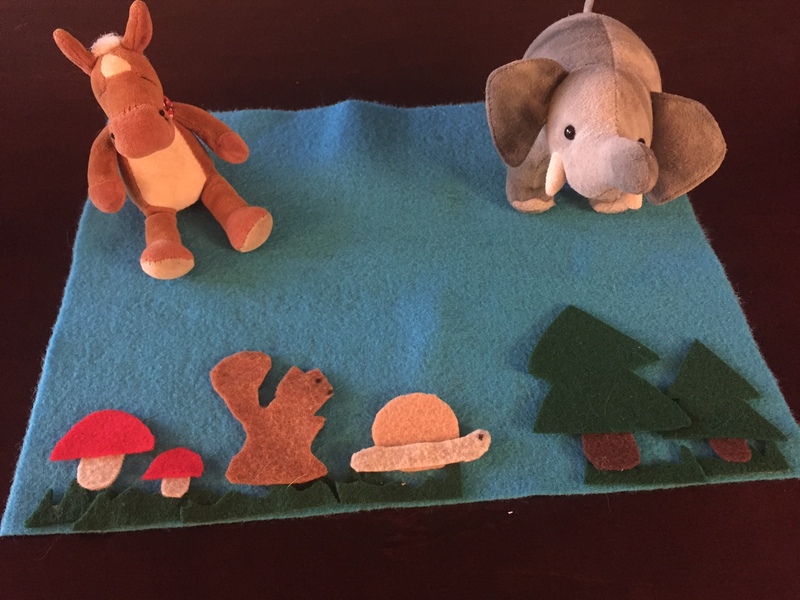 We made a jungle scene. There you have it! A super fun and easy craft to make on a cold and snowy day! Share your pictures of your art with us too!